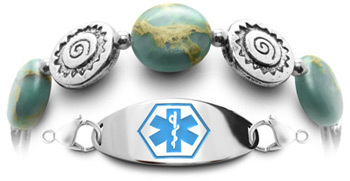 Over 600 designs, give you the world's largest selection of beautiful handmade medical bracelets—all custom sized and with personalized ID tags. Pretty designs created by Abbe Sennett a cancer survivor, fine artist and founder of Medical ID Fashions. All beaded medical bracelets are "overbuilt" with proprietary construction. Why? It's because you wear it everyday. Our proprietary design and materials outlast most ordinary beaded medical bracelets. The same goes for our stainless steel bracelets and longer lasting ID tags. 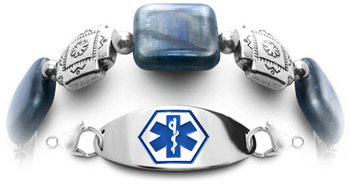 Every beautifully fashioned medical bracelet is custom sized to fit your specific wrist in the way you specify. No more small, medium and large! Give us a skintight wrist size and you'll get the right comfort room with our scientifically accurate system. The shackles have come off. With over 600 choices—you're free to express your own individual "fashion statement" that matches any lifestyle you wish. Now let your personality shine like never before.